I first tasted taho while I was accompanying my mom with grocery errands in middle school. At the time, I waited in the car in the hopes of finding crunchy shrimp chips among her grocery store bags; instead, my mom had two cups placed in the front seat cupholders and she started to explain what this sweet snack was—tofu, brown syrup, and sago pearls. An expression of exaggerated disgust spread across my face, as it so does when I hear of any food that's new to me, and I slowly took a sip through a wide-mouthed straw. From that sip forward, I knew that taho was the perfect, warm snack to have on a cold day. Not to mention, I realized that tofu wasn't just those spongy, white bricks floating in sketchy grocery store tubs (shh, I used to jab tongs in all of them). My attention was immediately drawn. We all knew we had to buy some and treat ourselves to a cup of heaven. The person selling taho in La Union and other sellers in the Philippines are called "magtataho," and they balance two large, aluminum barrels upon their shoulders with a long, wooden stick. Their daily schedule looks like a 3a.m. supply trip to the "pabrika" (factory) and early morning sales, which is when taho is usually seen and eaten. In fact, taho is known as a Philippine breakfast and snack. In the video below, you'll see that a seller's bucket is filled with fresh silken tofu and the other bucket has two compartments for arnibal and sago pearls. These sweet somethings weigh as much as 110 pounds upon a seller's shoulders and runs a customer about 10-20pesos. You'll be able to find other flavors throughout the Philippines but the most popular are strawberry (found in Baguio) and brown sugar. Taho is history in a cup. 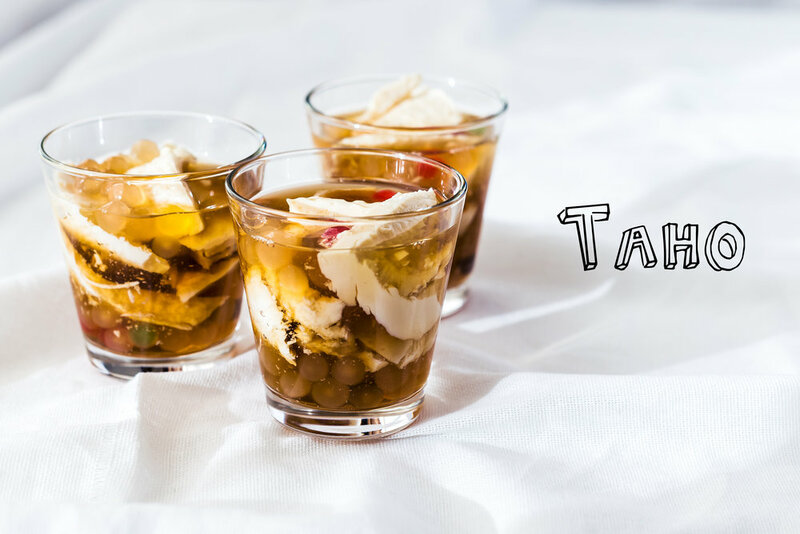 The word "taho" comes from "tau-hu" 豆腐 (pronounced dau-hu) in Hokkien Chinese, which literally translates to "bean" and "curdled" (a.k.a. tofu). Soybeans themselves originated in Southeast Asia and were first domesticated by Chinese farmers in 1100 B.C.. Taking an even closer look, Hokkien Chinese is a dialect of Min Chinese spoken in what is modern-day Southeast China, where ports were located to make 9th century trade with the Philippines possible. Similar to pancit molo, Chinese merchants brought this delicacy on their trade routes and influenced other existing cultures' food landscape. Below you'll find countries that have had Chinese food influence featuring the many versions of taho we have today. I write about the differences in how the dish is named, prepared, sold, and eaten. *Note that the countries I highlight below are modern-day countries and the lands weren't always divided in the way they are now. For example, the Philippines' 7,000 islands weren't banded together and called the "Philippines" until the Spaniards conquered the islands in the 1500s. Chinese douhua is a breakfast and dessert that can be served salty or sweet. In Northern China, the savory breakfast dish is paired with soy sauce and is served from stands and restaurants. Douhua from Hubei is served with sugar and Cantonese douhua is served with sweet ginger or clear syrup. All these varieties are eaten from bowls. In the video below, you'll see Sichuan douhua, which is sold in a similar way to taho. The woman in the video does a really good job explaining what Taiwanese douhua is. Check out all their toppings! Tau huay (note the influence of Hokkien Chinese word "tau-hu") in Singapore is also simply known as bean curd pudding. This snack is served in bowls and could be sold in stalls or dedicated tau huay stores. Interestingly, these desserts could already be portioned out into individual plastic containers and a spoon is used to break apart the tofu to mix in toppings when eating. Malaysia's tau fu fah is a silken tofu dessert usually served with either clear syrup infused with pandan, ginger syrup, or gula melaka (Malay palm sugar). From the videos I've seen, tau fu fah is served in stalls and usually complemented with other soy bean products like soy bean milk. Kembang tahu is soft tofu and palm sugar syrup that have been flavored with pandan leaves and ginger. This dessert can be served warm or cold and is often referred to as 'soft tofu in a ginger soup.' In the video, you'll see that the kembang tahu's storage containers look different from magtataho's two aluminum buckets. Instead, there is one container with legs and another container attached to an aluminum cabinet which stores bowls and soup spoons. In terms of getting people's attention, vendors use a wooden stick to hit what seems to be a round metal disc. Tau hu nuoc duong is Vietnam's version of taho and is sold as a common street food dessert. Vietnamese women use their shoulders to carry two large baskets on opposite ends of a pole and similarly to taho sellers, they chant "tau hu nuoc duong!" The main difference from this dish versus the Philippines version is that it is generously topped with a sweet ginger syrup instead of arnibal and sometimes have ginger slices present. This medicine-like dessert is often eaten in small bowls using deep-welled soup spoons. In the video below, you'll see that the vendor has disposable cups and reusable spoons and bowls. And from the videos I've seen, it looks like these vendors choose a spot to sell and wait until hungry customers pass. On medium heat, add water and brown sugar to a sauce pan and stir continuously until all sugar is dissolved. Simmer until mixture slightly thickens. Place tofu in a microwave-safe dish and nuke for about 1 minute or until heated all the way through. Divide tofu into cups, top with brown sugar syrup, and add your cooked sago pearls. Note: Be sure to buy extra soft silken tofu as some tofus may not have a melt-in-your-mouth texture. Alternatively, you can make your own bean curd by following this recipe.